I am going to give you my secret for not letting the world get me down and having resilience so I enjoy more and more of my life every day especially during difficult times. I am sharing this with you because I want you and the world out there to be happier and healthier. It’s better for me and all of us that way so please take a an estimated three minutes to read this. At the end of this short enjoyable piece of writing you will find a very special totally free gift I want you to have. 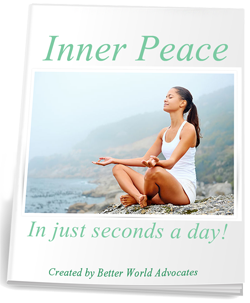 It’s a really cool new book to help you learn easy ways of bringing more peace into your life every day! Oh it’s normal at times, especially such as these times we live in to feel these emotions like frustration, cynicism, fear and anxiety. I am not meaning to dismiss your experiences nor your emotions. What I mean to say is please don’t dwell in helplessness or hopelessness! Please don’t let these emotions form into types of quicksand in your life that draw you deeper into unhealthy states of living. I say please because I look at the state of things around me, in my city and state, my country and this world and I feel like I really need you! I feel like we need each other! Because we are just not going to make it on our own especially if we get stuck in cynicism, self doubt and a vicious cycle of blaming the world and reacting to it. Okay so please read all the way to the end (it’s really not a long article) where I have included a special free gift for you I know you’ll enjoy! The idea I’ve learned is not to let my thoughts and feelings run away with me. The goal is not to stay aboard a runaway train to misery land. I heard someone say, people can only drive you crazy if you give them the keys! Hah! I love that! So true right? Oh yes it’s not easy to do I understand this very well. It’s not easy not to let people or the world push ones emotional buttons. Too often I end up yelling at my television set and then I realize they don’t hear my screams and I’m just hurting myself and then I take a deep breath or two or three. Then I turn off what my dad used to call the dumb box and I feel soooo much better! So with the mindfulness training I do I learn to recognize when my inner chatter is speaking at me with negativity, fear, anxiety, cynicism an blame riddled speeches. I come to think of this occurrence as the Anti-TED Talks of my subconscious brain. TED talks in case you’re unfamiliar with them are great talks people give to audiences about “ideas worth sharing”. Very inspiring stuff and I highly recommend everyone start their day with a TED talk or two instead of the latest morning so-called news. So my inner negative chatter you know what I call the Anti-TED talks turns out to have the opposite effect of what the real ones do on me. It demotivates me. “Why do things never work out for me?” or “Of course the bad guys always win” or “You can’t trust anyone anymore!” or “It’s just too hard why even try nobody will appreciate what you do!” these are some of the “hits” in the play list on my Anti-TED talk. Maybe yours are similar or different but you probably know what they are. Well I’ve come to use mindfulness meditation as a way to hit the “Skip this ad” button on these negative Anti-TED talks in my brain. Mindfulness meditation takes many different forms and I’ve found them all to be very useful to making my life better. One thing mindfulness meditation is not is emptying my brain or chanting some “mantra” over and over again. My brain is always thinking! I’m ADDHD, OCD. and probably a bunch of other letters and my brain’s always yammering away at me with new ideas and arguments. It’s just how I’m wired, it’s how my brain is coded. So trying to empty my mind with meditation is like trying to empty the Ocean. What mindfulness meditation is very simply is focusing on my slow deep steady breathing repeatedly and focusing my attention on each breath. As my brain starts to come up with a new great idea or rehash the latest political trauma going on in the country or at work I say to myself “aha that’s my brain talking..now back to my breath.” And breath in slowly and deeply focusing on how the air feels going in my nostrils and filling up my chest. I do this until the next feeling comes like “Oh gosh I should be working now and making money to pay my bills not doing this meditation stuff” then I say … “aha! That’s my emotions! …”Now back to my breath” I tell myself and I take another slow deep breath in and slow deep breath out and slowly a smile wells up inside me and emerges! So what I’m doing is building an awareness of my awareness or lack thereof. Get it? I’m teaching my brain to recognize when I’m not in the moment and by doing so I get to choose what I want to do, to think about and even feel next. I am not captured by my past emotions or fears of the future or triggered into feeling things because of something someone posted or tweeted! I meditate to build self awareness so that less and less often in my life do I find myself trapped in a runaway train of thought. This is very helpful because really when you think about it life is happening now. That’s all we have where we can make choices and affect the outcomes of our life. Our present moment is where we can choose things like peace, acceptance, happiness and compassion. We can help ourselves think better. We can help ourselves feel better. We can help ourselves choose healthier choices! This gives me great hope!!! How about you? Download this quick Mindfulness Meditation Guide Now before you forget to get it. Use it to get some ideas of how to get started practicing mindfulness so you can become more aware and I hope happier and healthier every day! When you download the PDF ebook you can click on it and read it and share it with friends and family members.